Bedridden from the flu? Medicare can’t help you. It’s a particularly nasty flu season this year, expected to be one of the worst in history…. and since it peaks through March, it’s not over yet. In fact, it hasn’t even leveled off since the holidays and flu-related hospitalizations are the highest in a decade. Adults over 65 are particularly vulnerable, especially if they have compromised immune systems due to other illnesses or health conditions. 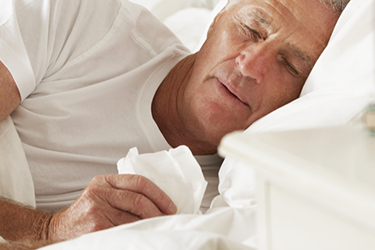 Diabetes, heart disease and lung disease are just a few potential complications that can cause flu to become dangerously debilitating, landing the ill in bed for weeks at a time. Is it too late for a flu shot? No – it’s recommended for all adults over 65 years old and may prevent up to 30 percent of flu cases, not insignificant given the increased risk of mortality. If you do get the flu despite the shot, it can lighten the impact and speed recovery. If you’re bedridden from the flu and completely unable to care for yourself, will Medicare pay for home care and transportation to the doctor? No, here’s why. Medicare is an insurance program, with specific eligibility requirements to qualify for home care coverage. It must be prescribed by a physician as a short-term alternative to recovering in a hospital or skilled nursing center, and most importantly – in conjunction with skilled care. Medicare only pays for short-term care ordered by a physician that is medically necessary. Caregivers, companions, meal service and transportation is excluded. What exactly does that mean? If you have the flu and only need unskilled home care to assist with normal tasks of daily living (showering, dressing, preparing meals), Medicare won’t help. Benefits are intended to help the insured heal from major illness or injury, not to handle normal tasks of daily living for someone impaired by a cold or flu. You must pay out-of-pocket for the costs of your care. If you’re under the care of a physician and need skilled care from a registered nurse (RN) or licensed practical nurse (LPN), home care can be a covered benefit. It must be ordered by the doctor with services provided by an in-network certified home health agency. For example, if you’re home recovering from a knee replacement and come down with the flu, home care can probably be added to the skilled care you’re already receiving. Will a Medigap policy cover unskilled home care? Unlikely, since those additional insurance policies also require medically necessary short-term care to qualify for the gap benefit. The same “non-medical care exclusion” applies to private health insurance and long-term care policies, although it’s important to review the policy for specific non-medical care benefits. If you have a universal life insurance policy with cash value, it may be possible to pay for home care using a withdrawal against the policy. (This article explains the topic in more detail.) It’s not recommended if you have enough in savings to cover the costs, however. Tapping into retirement investments should be avoided whenever possible, and speaking to your CPA or investment advisor can be helpful. Thoroughly understanding your care options, insurance benefits and limitations, and resulting financial impact of an unexpected illness is a smart way to be proactive, so you aren’t frantically researching options if something happens. For those planning ahead for future care scenarios and exploring their retirement lifestyle choices, Life Care communities can be a very attractive option. It combines a lifestyle-rich independent living community focused on health and wellness with predictable costs and a guarantee of care, no matter what happens down the road. Care is available without caps or limitations. Plus, depending on the plan selected, home care services, companion care, meals, transportation and light housekeeping are completely included at no extra charge… even 24/7 assisted living and memory care. To learn more, register for a Life Care workshop today or contact Jackie Lusson, our corporate director of sales, at 623-236-3767 or Jackie.Lusson@sunhealthsl.org.